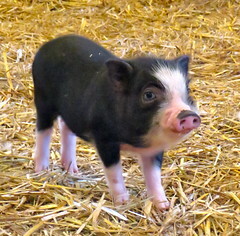 Male Pot Belly Pigs should be neutered if they are not going to be bred. Neutering a pot belly pig will result in less odor, aggression, reproductive issues, reduce tusk growth, and will also obviously eliminate breeding. This procedure involves removing the testicles under anesthesia and can be done on an outpatient basis. Neutering pot belly pigs is a straight forward procedure and no overnight stay is needed. Pot belly Pigs should be fasted for about 8 hours prior to surgery, but should have water until you leave the house. Drop them off at 8am and pick up between 4pm and 5:30pm. Bring a food supply for after surgery as they will be ready to eat soon after recovery. Pain medication will generally be given for 2-4 days by mouth. Keep separated from other pets for 7 days for incision to heal. Male pot belly pigs may be able to impregnate a female for up to 6 weeks following surgery.